The UK has some of the highest penalties in Europe for those that are caught using their phone behind the wheel, road safety charity IAM RoadSmart has discovered. In 2017, tough new rules were introduced which means that drivers caught now face the possibility of a £200 fine and six penalty points on their licence, and now makes UK penalties harsher than those of France, Italy and Germany. 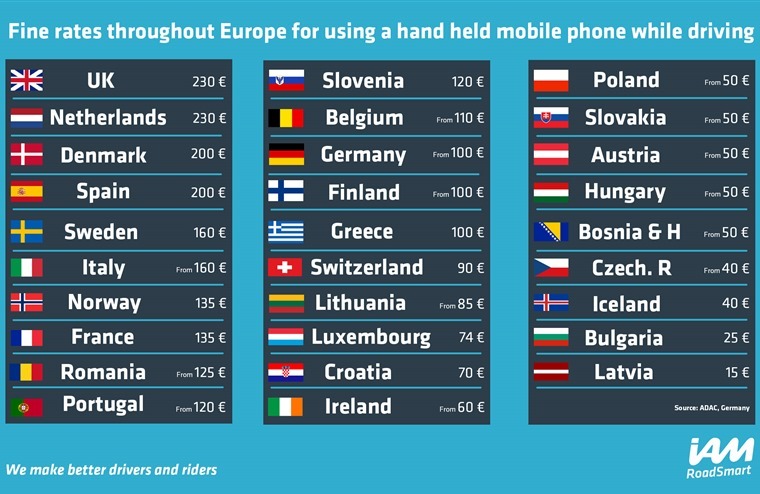 Bulgaria, Iceland, Croatia, Latvia, Lithuania, Luxembourg, Austria, Poland, Switzerland, Slovakia, Hungary and Czech Republic all have fines of under 100 Euros. Germany fines up to 100 Euros, France 135 Euros and Italy 160 Euros. In Spain and Denmark, the penalty is 200 euros and, with the UK fine equating to around 230 euros on current exchange rates, it is only equalled by the Netherlands (230 euros). Figures published by the Ministry of Justice show the number of offenders convicted of “using or causing others to use a handheld mobile phone while driving” stood at 11,961 for 2016 – the last year full year of statistics that are currently available. 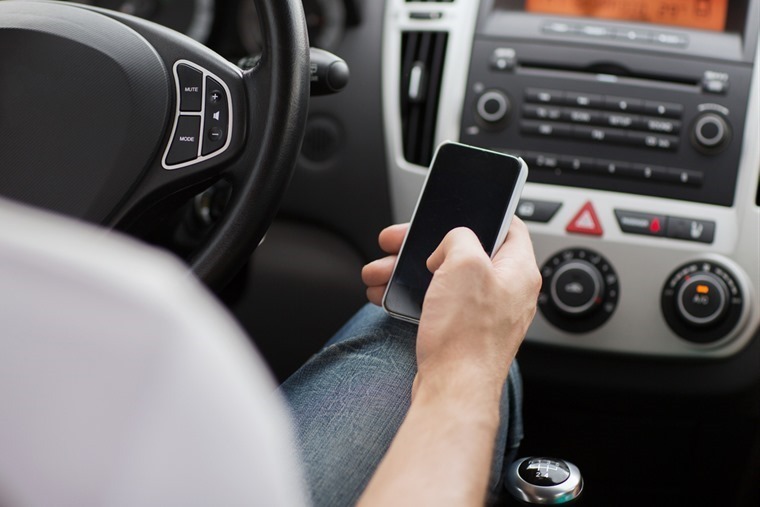 Insurance company Confused.com recently found that the number of drivers given Fixed Penalty Notices for using a mobile phone behind the wheel fell 39% last year – from 49,694 in 2016 to just 30,470 in 2017. In total, 158,000 penalty points were issued to the offending motorists in 2017. Although this demonstrates tougher penalties might be having an effect, a separate survey found that 34% of motorists said the new rules had deterred them from using their phones behind the wheel, suggesting a decline in traffic police might also be having an impact on the figures. 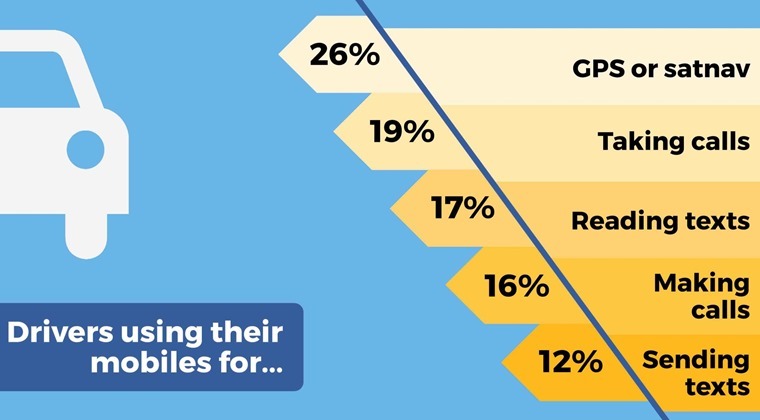 Similarly, research by Kwikfit indicated that up to a third of all drivers are still flouting the law, with more than a quarter (26%) of drivers using their phone for map applications, while 19% also admitted taking calls or reading messages. IAM RoadSmart’s own Safety Culture Survey showed that 90% of those surveyed felt the dangers caused by people accessing social media or email messages while driving was a significant threat to their personal safety and they felt it was an even bigger threat than drink-driving. Demographically, it was younger drivers who are most blasé when it comes to dialling and driving. 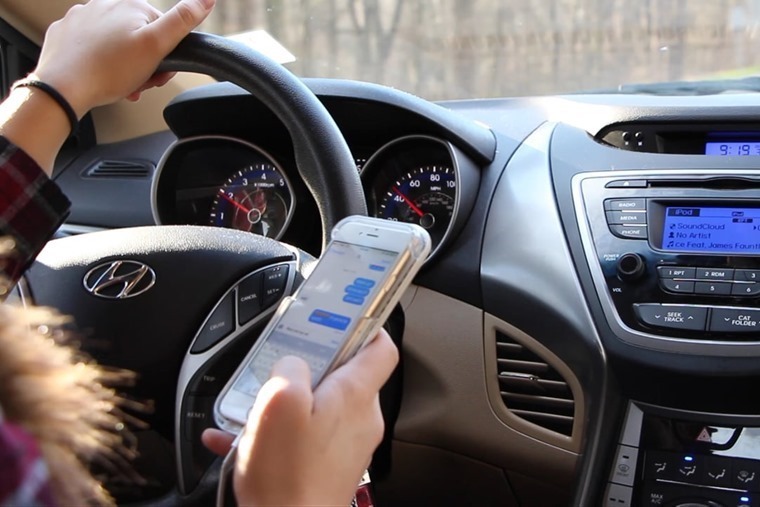 The 18-24 age bracket are twice as likely than older people to answer calls, and three times more likely to believe it’s legal to check your phone when stopped at traffic lights. Silliars added: “What we want to see is a combination of effective penalties, more personal and corporate responsibility and vehicle, smartphone and social media companies working together to generate hi-tech solutions to the distractions caused by their technology.